This is the first of several post that we will be releasing in the next few weeks and months to better document Portable OSM. We use POSM extensively in our work and more and more people have asked how they can get started. This guide will cover how to get POSM up and running on an Amazon EC2 instance. Future guides will walkthrough how to install POSM on an Intel NUC and our model and methods for doing large scale OSM field data collection. Interested in running POSM in the cloud? This type of setup is great for semi-connected instances when you want the integration of OpenMapKit/Field Papers/OSM but have more regular connectivity with your surveyors. First, this guide will walk through how to set things up in Amazon Web Services, specifically EC2. If you like another flavor or cloud services such as Azure, this process will still work but may look slightly different. This guide will also not show you how to get an AWS account, they already have great documentation. Before installation, you should choose a domain name and host to use to access your new POSM and configure it with your DNS provider. If you don’t do this, you won’t be able to access the OpenStreetMap interface. Create the subdomain osm.example.org . You’ll configure the DNS later. The first thing you will need to do is start a new instance. In your AWS EC2 Dashboard click on Launch instance. Scroll all the way down and find Ubuntu 14.04 LTS. The posm-build process only works on Ubuntu 14.04 at this time. After selecting your instance type you’ll need to fill out a couple more things. Below are the recommended specs. If you use less than 8GB, you will not be able to run the OSM part of POSM. OpenMapKit Server runs happily on 2GB. After the instance is created, also create an elastic IP and assign it to the instance you just created. AWS has a great guide for this. Now configure the DNS. Create an @ record and point it to the IP address that you just created and assigned to your instance. POSM Cloud uses posm-build to install because the live ubuntu instance for physical devices doesn’t work. The process take a little longer and requires a little bit of command line knowledge. 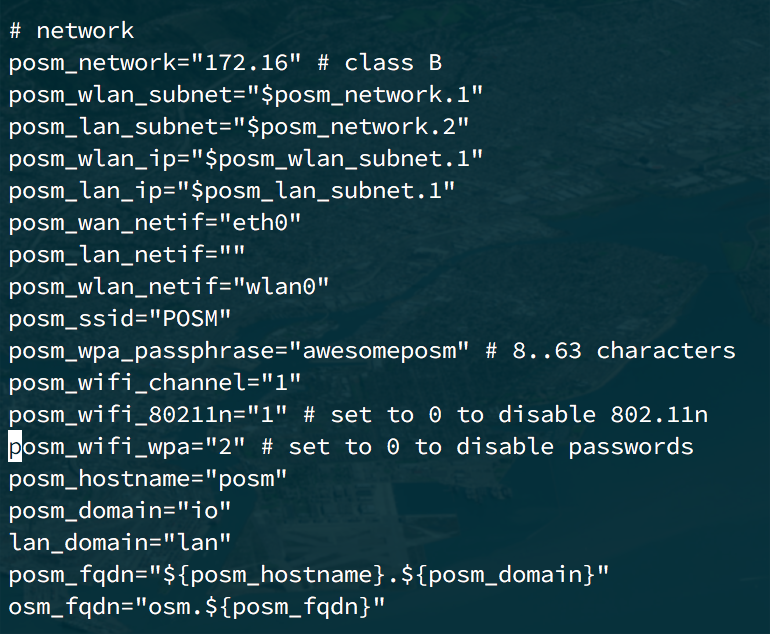 To configure POSM on your cloud host, connect to it using ssh and run the following commands. The important things to edit are posm_hostname and posm_domain. Set these equal to your hostname and domain that your purchased earlier. You can comfortably ignore all the wifi settings. The last thing is to install everything. This will take a while; go get a snack and come back. The above command will install everything needed to run POSM Cloud but will not install OpenDroneMap. To add SuperPOSM capabilities (OpenDroneMap + GeoTIFF processing), use the following instead. OpenMapKit server does not apply authentication out of the box; you will need to set it up to ensure that sensitive information cannot be viewed on your cloud instance. This step requires more command line knowledge. If the POSM cloud install was successful, then you should now be able edit your OMK server settings. You will need to uncomment the lines starting with “auth” and add in the credentials you would like. After saving, just reboot your server and authentication should be working when you go to OMK Server. After everything is configured you can go to your domain and you should see the following screen.